Fifteen students from Lebanon High School and Thetford Academy have graduated from a semester-long high tech manufacturing and engineering program at Fujifilm Dimatix and Hypertherm. The program, called STEM Internship: High Tech Manufacturing & Engineering, is an Extended Learning Opportunity developed in partnership with area high schools. In development for nearly two years, the program brought students from each school and placed them into the businesses as part of their regular school day. The program ran for the duration of the first semester of their school year and students earned credits toward their graduation requirements as well as earning college credit through the Running Start program. Students were introduced to concepts such as human resources, resume writing and interviewing skills, product development, prototyping and engineering, production and manufacturing processes, and finance, sales, and marketing. 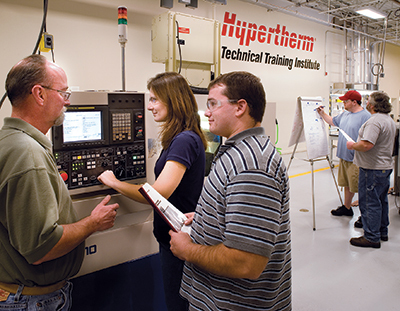 The daily sessions provided students real-world, hands-on examples of business and manufacturing concepts in action at each of the businesses manufacturing facilities. Akumina, an internet platform company in Nashua, is moving into a larger, smart-enabled office space to support its global enterprise customers. Akumina grew its staff by more than 50 percent in 2018 and saw 130 percent year-over-year growth in revenue. Its success has won the company industry recognitions such as Intranet Choice for the Digital Workplace in ClearBox Consulting’s 2019 report.The company plans to increase its staff again by 50 percent this year. Its customers include Europe’s leading telecommunications and IT services company, which operates Akumina’s software in over 150 countries, one of the world’s leading consumer packaged goods companies with over 400 brands and products available in 190 countries, and North America’s leading educational publisher, leveraging Akumina to offer products and services in over 60 unique languages. Solar Wolf Energy, a Millbury, Mass. solar panel and system installer, has announced it will construct and commission a 5 megawatt agricultural solar farm in Concord, NH. The system will be built on 15 acres of land at Lewis Farm in Concord. The owners of the farm, James Meinecke and Rebecca McWilliams, are strong supporters of renewable energy. "For us, a solar farm is key to the next generation of farming," said Meinecke. "It helps us continue supporting our community with renewable energy in addition to our fresh, local vegetables." Solar Wolfe anticipates adding several more solar farm projects. It has installed 40 MW of power from as far as North Carolina, and expects to enter the Maine market, now that Governor LePage has left office. The New Hampshire State Library loaned more than 1 million digital books in 2018, joining the "Million Checkout Club" highlighted by ​Rakuten OverDrive, a digital library provider based in Cleveland, Ohio, that said 65 public library systems in the U.S., Canada, Singapore and New Zealand have reached this milestone. "This illustrates how libraries have transformed using digital lending of ebooks, audiobooks and magazines," Rakuten OverDrive said in a press release. The complete list of companies part of the "Million Checkout Club" can be found here. Bernstein Shur has named Christina Ferrari, an attorney who represents biotech firms in New England, and Talesha Saint-Marc shareholders. GraniteOne Health — a nonprofit healthcare system consisting of Catholic Medical Center in Manchester, Huggins Hospital in Wolfeboro, and Monadnock Community Hospital in Peterborough — and top Oracle integrated cloud solutions partner, Travercent, have announced the successful go-live of Oracle ERP and HCM Cloud applications at Catholic Medical Center and Huggins Hospital. The goal of the combined organization was to replace multiple aging disparate systems with a modern, fully integrated, single platform cloud application to facilitate growth and efficiencies. Travercent implemented Oracle ERP and HCM Cloud with the following applications: financials, expense management, purchasing with self service requisitions, inventory management, human resources, payroll, self service, recruiting and onboarding. The talent management applications of performance, goals and compensation management, along with enterprise planning and budgeting cloud service, will go live in March of 2019 – providing the two hospitals with a comprehensive 360-degree view of the business to support their current and future needs. Ronald C. Whittemore, a retired programmer, has been recognized by Marquis Who's Who, a directory containing notable biographies. For much of his career, Whittemore served as the programming manager at Datamann Inc. in Wilder, Vt., though worked earlier in his career as a senior programmer for Computac LLC in West Lebanon and Joy Manufacturing in Claremont.